The fields of photonics and phononics encompass the fundamental science of light and sound propagation and interactions in complex structures, as well as its technological applications. This book reviews new and fundamental mathematical tools, computational approaches, and inversion and optimal design methods to address challenging problems in photonics and phononics. An emphasis is placed on analyzing sub-wavelength resonators, super-focusing and super-resolution of electromagnetic and acoustic waves, photonic and phononic crystals, electromagnetic cloaking, and electromagnetic and elastic metamaterials and metasurfaces. 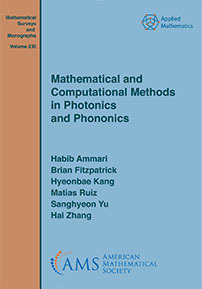 Throughout this book, the authors demonstrate the power of layer potential techniques for solving challenging problems in photonics and phononics when they are combined with asymptotic analysis. This book might be of interest to researchers and graduate students working in the fields of applied and computational mathematics, partial differential equations, electromagnetic theory, elasticity, integral equations, and inverse and optimal design problems in photonics and phononics. Graduate students and researchers interested in recent development in mathematical and computational advances in photonics and phononics (light and sound propagation on complex structures).